This report, held in the National Security Council Files at the Richard M. Nixon Presidential Library, had been denied in its entirety by the CIA, first in response to the initial request and subsequently in response to an appeal. 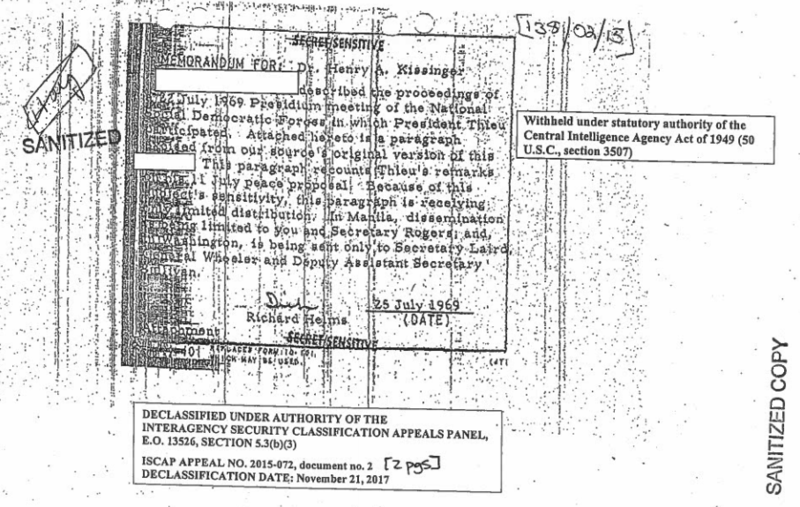 A final appeal by the National Security Archive to the Interagency Security Classification Appeals Panel produced a decision to release the document except for a few details on the South Vietnamese source of the information. This recent decision demonstrates ISCAP’s continuing value for declassifying historically significant information. 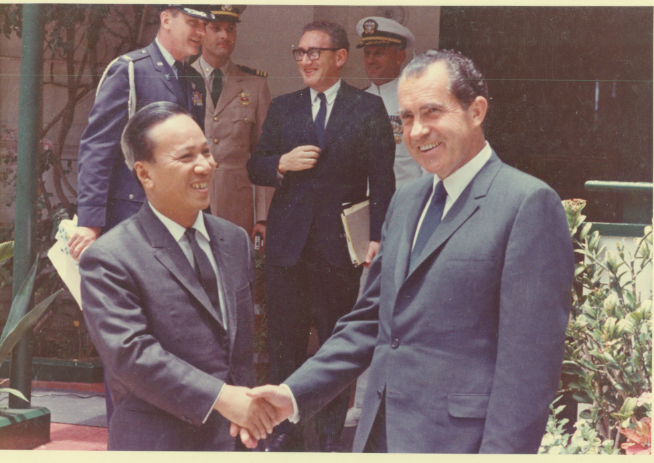 President Richard M. Nixon meeting South Vietnamese President Nguyen Van Thieu, late July 1969. The discussion covered in the report refers to one of the core demands of the Hanoi Politburo and the NLF for a coalition government between Thieu and the NLF. (Some in the US antiwar movement had also suggested such a coalition as a compromise diplomatic solution to ending the war.) But Washington and Saigon had consistently rejected this approach. President Nixon’s most recent diplomatic proposal on May 8, 1969, for example, had sidestepped the issue by vaguely calling for international oversight of South Vietnamese elections, in which, presumably, the NLF could participate. But the US president had also made it clear that Washington would be willing to discuss political issues with Hanoi only if Saigon concurred – which, of course, was not likely. Thieu steadfastly refused to negotiate the fundamental matter of who should hold power. At his July 22 meeting with the National Social Democratic Front, Thieu was attempting to win support for his new negotiating stance, which now dovetailed with Nixon’s. Earlier, on July 11, and following Nixon’s lead, Thieu had also advocated South Vietnamese elections. Both he and Nixon could now claim that they were on the same page. Elections in the midst of war, however, were problematic, and the proposal was unacceptable to the NLF. 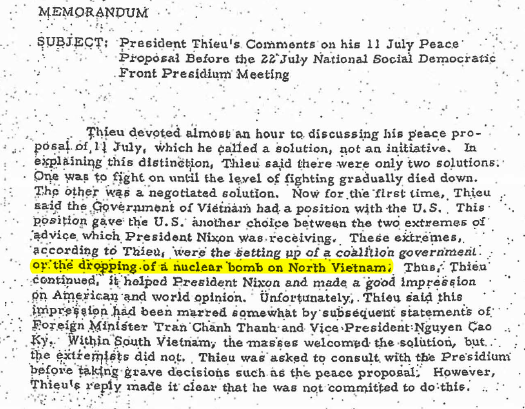 Thieu’s second and more startling announcement – that Nixon was being advised to use a nuclear weapon against the North – raises the question of when and from whom Thieu got this information. In our book, Nixon’s Nuclear Specter: The Secret Alert of 1969, Madman Diplomacy, and the Vietnam War (2015), we documented Nixon’s interest before, during, and after 1969 in making Madman Theory nuclear threats against North Vietnam. We also established that the option for dropping two atomic bombs was included in a mid-September “concept of operations” against the North. Henry Kissinger was a willing and active co-conspirator in this regard. It is possible that Saigon’s representatives in Washington or its intelligence network gleaned information from White House sources about Nixon’s and Kissinger’s pre-September nuclear musings. It is also quite possible that Nixon informed Thieu about the nuclear threat option during their meeting at Midway on June 8, 1969. Kissinger’s brief record of the meeting mentions deadlines, which Nixon and Kissinger used later in the summer to support threats against Hanoi, but he makes no reference to nuclear weapons. It is also possible, however, that not all of the Nixon-Thieu conversations were written up. According to the White House Daily Diary for that day, Nixon and Thieu had several hours of meetings, including some with advisers. That Thieu had English language skills meant that there was more time for conversations with Nixon on Midway that did not require an interpreter. Whether Kissinger was present at all of these or kept a detailed record of them is unknown. If Nixon did mention a nuclear weapon option to Thieu at Midway, he probably did it for strategic and political reasons. As a convinced proponent of the Madman Theory, Nixon may have wanted to clue Thieu into the strategy that he believed that Dwight D. Eisenhower had carried out to end the Korean war: by making secret nuclear threats to China. With such a threat, Nixon may also have wanted to ease Thieu’s disappointment on learning that his administration would soon begin withdrawing US troops from Vietnam. While no evidence supports the claims about Eisenhower and the Korean War, Nixon nevertheless assumed that if secret threats had worked for Eisenhower, they were also applicable to the Vietnam situation. Nuclear threats could be used to coerce Hanoi and its Soviet patrons in making concessions at the conference table. Accordingly, in the first months of the administration, Nixon intended to signal the “Soviets about the possibility that we are losing our patience and may get out of control.” If Nixon did say something to Thieu along those lines, it is possible that Thieu interpreted him to mean that the United States might drop a nuclear bomb. Or, Nixon may have told Thieu that dropping a nuclear bomb was an option. Whatever Nixon said to Thieu might not be lost for all time. Two sources that are presently unavailable may someday shed light on the inner workings of the Nixon administration, including more information on the Nixon-Thieu conversations. First, Nixon kept a diary, which apparently is in the hands of the Richard M. Nixon Foundation. Second, Kissinger also kept a diary (or “office journal”), partly with the assistance of White House staffers. That record is also inaccessible, although the role of official government assistance in compiling it suggests that the Kissinger diary should reside in the National Archives. If those sources ever become available, exactly what Thieu (or his representatives) heard from Nixon or Kissinger may become known. If Thieu kept a private record of the discussions it has yet to surface. Jeffrey P. Kimball is emeritus professor of history at Miami University.